You cannot download Windows Live programs unless you are connected to the internet. 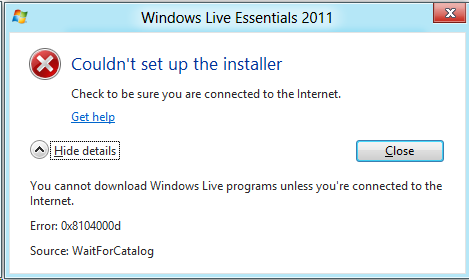 If your Internet connection is slow or unreliable, you might want to download an installer file for Windows Live Essentials and then run the installer when you aren’t connected to the Internet. This installation method can also save time if you want to install Windows Live Essentials on several computers. After you download the installer file onto one computer, you can copy it onto others to install Windows Live Essentials there. Use the installer file links provided on this webpage to find the one that corresponds to your operating system and language, and then click the link. When asked if you want to run or save the installer file, click Save, and then save the file to your desktop. To install Windows Live Essentials on the computer that you’re using, click the wlsetup-all.exe file on your desktop, click Run, and then follow the instructions on the screen. I see your blog needs some fresh & unique articles. Writing manually is time consuming, but there is solution for this.